With the BBQ boom that our country has experienced over the last decade has come the introduction of hundreds of new and creative sauces. 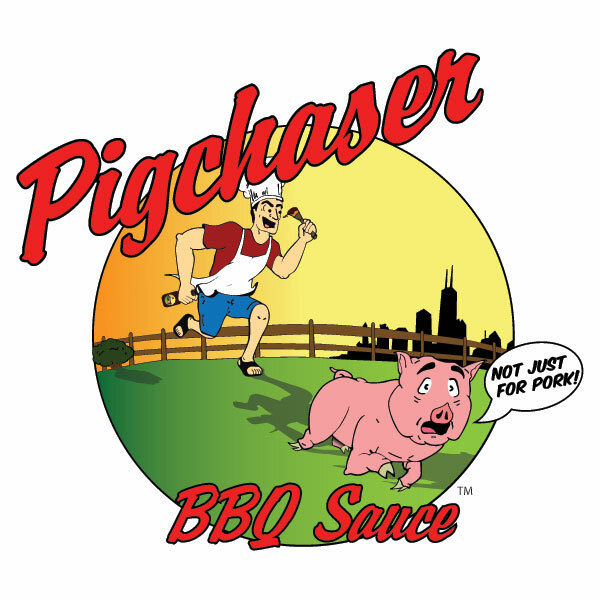 Pigchaser BBQ (Grayslake, IL) joined the fray in 2007 ﻿and has already made a significant mark on the specialty sauce market. This innovative company produces five different sauces ranging from Pineapple-Mango to a Bacon BBQ sauce containing real chunks of bacon. Like the products they produce, the story behind the Pigchaser name is equally unique. I won't go into great detail (You can read the story here), but it involves the owner of Pigchaser actually chasing a pig in the middle of the night through an Arizona desert. After speaking to Ron (The Pigchaser) on the phone about his product line, he was kind enough to send me some of his award winning Habanero BBQ Sauce. The sauce recently earned a coveted 1st place Scovie in the "American Style Hot" category. The prestigious Scovie award is one of the most respected honors in the industry. After reading this year's contest results, I was anxious to give Pigchaser a try. Like all Pigchaser BBQ sauces, Habanero is packaged in stout 16 oz. bottles. The white label features the Pigchaser BBQ Sauce logo as well as a creative description of the sauce's characteristics. Additionally, the label displays standard items like nutrition facts and ingredients. Through the bottle, the sauce is a beautiful red color and speckled with multicolored spices. The thick sauce, pours very slowly in the tradition of Kansas City style BBQ. While I enjoy sauces with a kick, I'm always a little apprehensive when tasting a habanero product for the first time. Unfortunately, too many companies abandon flavor for the sake of heat. Rather than making a sauce that tastes great and also has a burn, they set out to make the hottest sauce possible and pray that the flavor is decent as well. Thankfully, my fears were immediately put to rest after the first taste. Pigchaser Habanero BBQ sauce is very sweet initially. The sauce uses multiple sweeteners like honey, brown sugar, pineapple juice, maple syrup and molasses to create a far superior flavor to the one note sweetness provided by HFCS. There is also a slight hint of hickory from the liquid smoke. The heat level is substantial, but sneaky. The sauce allowed the sweetness to take over my mouth before busting my tongue with the habanero burn. While it caused my nose to water and forehead to sweat, I couldn't help going back for more. The heat slowly built with each bite, but it was a pleasant pain. The blend of sweet and heat were exactly what I look for in a hot BBQ sauce. I brushed the sauce on free range chicken quarters from Shelton Poultry just before they finished cooking. The thick sauce worked perfectly as a glaze. Though I enjoyed the sauce on chicken, I couldn't help thinking about how good it would be on ribs. For those with an appreciation for fiery foods, Pigchaser Habanero BBQ could be the perfect rib sauce. I love BBQ and fiery foods, but I rarely find products that combine sweet with heat as well as Pigchaser. After testing their Habanero BBQ sauce, I can see that their Scovie award was well deserved. Learn more about Pigchaser BBQ Sauces by visiting their website. See how their Habanero sauce compares to other sauce on our "Product Reviews" page. 1 Response to "Pigchaser Habanero BBQ Sauce"
Great review Shorts..............Keep up the good work.